So, what inspired you to run your own pub? Since my first day in hospitality in 1991, I have always thought about having my own place. My inspiration has always been to run a place that I would like to go to and to run it in a way that I think is morally and ethically right. Tell us a little bit about your background before The Greyfriar? Believe it or not, my hospitality career started in a heavy metal night club in Manchester called Jilly's Rockworld! I was in a French circus at the time called Archaos and came back to London with them before continuing to work in bars and clubs. Eventually I found my way into higher end restaurants: Shumi (Jamie Barber, of My Million Pound Menu fame, and Geoffrey Moore, son of Roger); the opening team at Roast restaurant in Borough Market; Benares (Atul Kochhar, also My Million Pound Menu); Moti Mahal ( fine-dining Indian); Gordon Ramsay Holdings (running both The Narrow and York & Albany). This all eventually lead me to Stovell’s in Chobham for a good while, before I moved back to London and ran JW Steakhouse on Park Lane and then became an area manager for Affinity bars and restaurants, running Princess Victoria, The Lady Ottoline and Dickie Fitz. Finally, I found my way to The Greyfriar in 2017 - and here I am today. What first inspired you to work with food and drink? I fell into the industry, as a way of supplementing my terrible circus wages. I then found that I was quite good at it and enjoyed it. I have always been front of house and have always enjoyed that face-to-face interaction. To someone who has never visited The Greyfriar before, how would you describe the pub? The Greyfriar is a traditional looking pub mainly serving traditional dishes - but we also offer some innovative and experimental food too. We try to use food that is sourced as locally as possible, and aim to bring a little bit of London panache to the countryside. There is a Welsh/Spanish influence here as well. Our head chef, Dan Rees, is from Cardiff and Norma, my wife, is Spanish. This mainly shows up in our bar snack menu. With our special events (La Noche Espanol and guest chefs), we try to give new experiences to our regulars. Are there any dishes on the menu that you particularly love at the moment? We change our menu seasonally but we also meet at least once a week to review and tweak things according to feedback. At the moment our hake and pork belly dishes are particular favourites of mine. On the menu, we have seasonal salad, butcher’s cut and market fish options that change very often, if not daily. How about behind the bar? What’s a little bit special for the passing connoisseur? Although we are tied to Fuller’s, I push where I can to get unique and interesting products on our shelves. Gin is a focus and we are lucky to have Gorilla Spirit Co and Winchester distilleries very close to us. I also have a few Spanish gins that are very hard to come by, namely Vanagandr which my father-in-law brings over every time he visits! We are also big supporters of Greyfriars Vineyard, in Surrey, and have replaced our prosecco with their cuvée and it’s selling really well. The gin tasting experience is an informal evening with my good self. We learn how to taste spirits and then we taste different styles, i.e. London Dry, Plymouth, Old Tom and Small Batch. We chat about the history and different production styles of gin, as well as the history of tonic. The rest of the evening is then all about drinking, normally with me making a cocktail of their favourite gin. We are thinking of offering a gin based three-course meal, but that is still a work in progress. My three favourite British gins of the moment are: Gorilla Spirit Co’s Silverback from Four Marks, Winchester Distillery’s Winchester Dry Gin and Beckett’s London Dry Gin from Kingston-upon-Thames. Are there any suppliers who you particularly couldn’t live without? We have a great relationship with: The Cheese Stall in Winchester supply our cheese board and smoke our Caerphilly; Meadow Cottage Farm is our ice cream supplier and may also be supplying us with old cow meat (similar idea to Galician beef); Txuleta supply our Galician beef; The Gentlemen Baristas of Borough Market, who supply the best coffee I have ever tasted; and Mark Turner and Daughters of Aldershot, who supply our meat and have been fantastic in getting us hard to find stuff such as lamb cheeks. Finally, what’s the best thing about being based in Chawton - and Hampshire more widely? I have not missed London a bit. We have been greeted by the village community with open arms and Iago, our six-year-old, absolutely loves the village school. We are extremely close to Alton town and its facilities, but you would never think so. Hampshire in general has some great places to visit, as well as produce to eat and drink. And it would seem that everything is 20 minutes away! After living in London for most of my life, it’s still a novelty I enjoy. 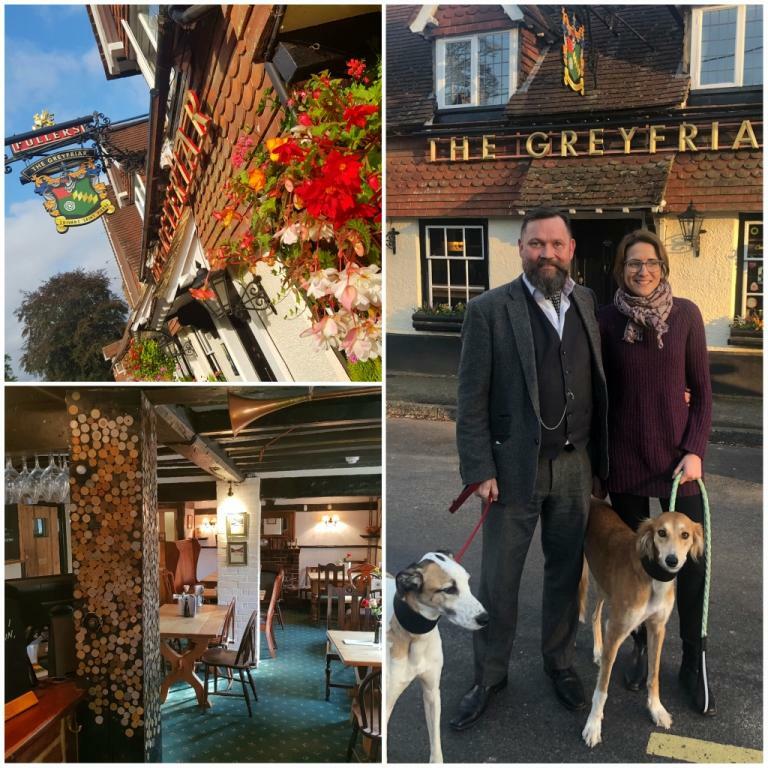 The Greyfriar is found at Winchester Road, Chawton, Alton, Hampshire GU34 1SB. For more about their story, click here. "We are having a refurbishment starting on Monday February 18, but we will remain open for most of it with just a four day closer at the end from Monday March 4 until the morning of Friday March 8," says Simon. "It will mainly be cosmetic, with no real heavy work being done. On Friday March 1, Dan, our head chef, is putting together a seven-course St David’s Day menu, which is booking up fast. On Monday April 8, we are hosting chef Saurav Nath (Benares, Gymkhana etc) for an Indian guest chef night. In the summer, we will doing a pop-up here for Fire & Smoke Social, a local fire pit man. We will continue to bring in chefs and put on monthly live music throughout the year, so watch this space."